"Tall is the new cool," says Maruti Suzuki as they let loose their first contender in the sub-four metre SUV space. That clearly is justification for putting a hatchback-sized vehicle on stilts and hoping that it attracts customers with ambitions to buy an SUV. It is like men growing beards to look manlier on their Tinder profile picture and hoping that women swipe right. But interestingly, it seems to be working. The Ford EcoSport is the best example of this phenomenon. A Fiesta hatchback-based chassis covered with puffed up bodywork that draws inspiration from beefier SUVs that wear the blue-oval. The result is a car that looks imposing despite its diminutive size. Though four years old in the market now, it still manages to look handsome and that is precisely the reason why the recent update given to it was so mild that you wouldn't recognise it at a passing glance, unless those slim LED running lamps manage to grab your attention. We hear that a more comprehensive facelift is in the works, but is at least a year away. 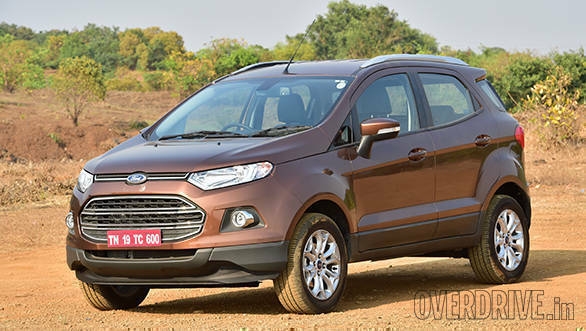 The Ford EcoSport has enjoyed a virtually unrivalled run, only to be challenged recently by Mahindra's TUV300. But the Indian SUV giant has been clear in its approach with the TUV. They wanted to build a compact SUV in the true sense of the word and that too, a rigid one to take on everything from the smooth roads in the metros to the non-existent ones in rural India. The TUV300 therefore, is based on the Scorpio's proven body-on-frame architecture. Though its straight lines and slab sides look out of place in today's design preferences and can polarize buyers, it manages to grow on you and has plenty of presence. 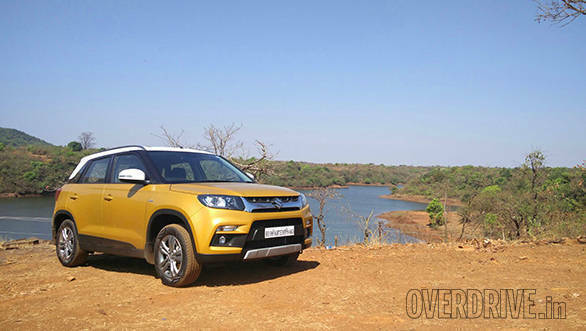 The Maruti Suzuki Vitara Brezza is the production form of the Maruti Suzuki XA Alpha concept from 2012, but through its four-year journey to the production line it has gone through plenty of changes. From the rumoured Swift underpinnings to getting a new C-platform and from previewing a boxy design to transforming into a more contemporary form, the Brezza is well-poised to take the market with a storm. The Vitara inspired styling gives it the appearance of an urban SUV, while the floating roof effect and the hunched shoulder line give it a sense of expanse that one associates with an SUV. Detailing by way of the off-set turn blinkers in the front bumpers, the faux scuff plates and the black cladding all-around, prevent the bodywork from looking drab. The optional dual-tone paint scheme on the top spec trim looks quite good too, while the trims without it don't look bad either. To me, it did not evoke a 'wow' expression the way EcoSport or the Creta did the first time I saw them. But the Maruti Suzuki Vitara Brezza certainly looks handsome and like most other cars from this stable, it has a design that will age well. The EcoSport still has one of the smartest looking cabins at this price point, though not necessarily the most functional. The cell-phone inspired layout for its infotainment switchgear can be confusing to use due to the sheer number of buttons. The interface for the hardware and software is sorted, although a touchscreen infotainment should have been offered by now. 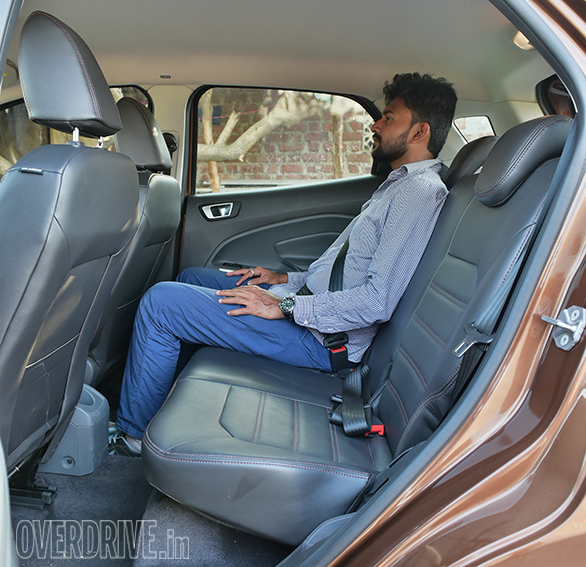 Finding a good driving position on the EcoSport isn't difficult, but the front passenger seat is set a bit higher than expected. The front seats felt tight for my frame but the cushioning wasn't uncomfortable over long distances. The rear seats are nicely contoured for two adults, but fitting three adults abreast is a problem. 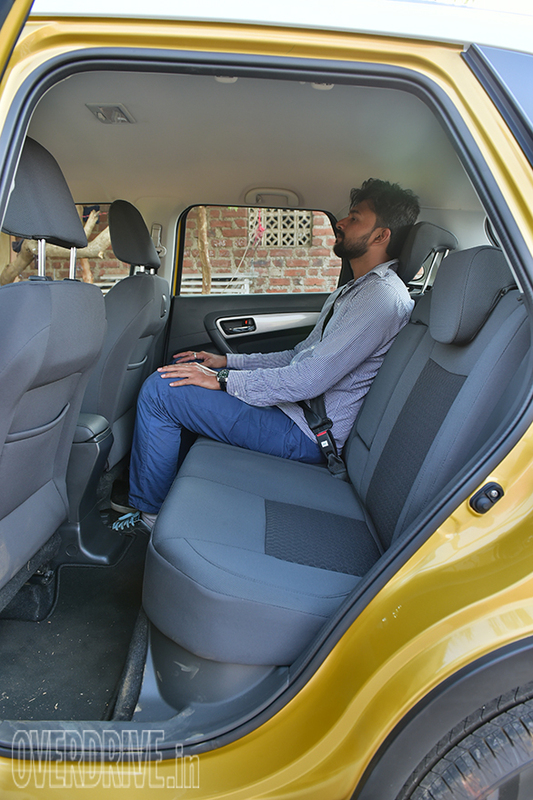 There is no doubt that the EcoSport's cabin is the smallest in this test, but ingress and egress is easy. It is also the safest place to be in - from the reassuring thud of the doors to the safety kit consisting of up to six airbags, traction control, ESP, ISOFIX points for child seats and the automated emergency calling function. The Mahindra TUV300 needs you to climb into the cabin, thanks to its high floor. Brighter materials instantly make the cabin feel the roomiest of this lot, and it actually is. 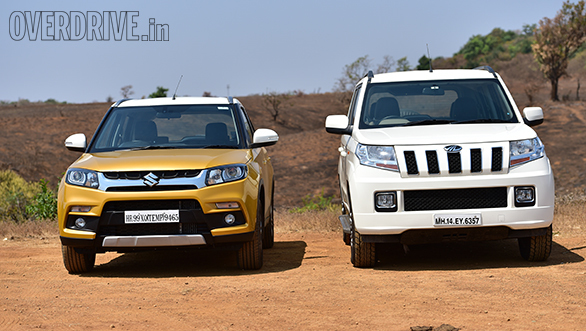 The Scorpio underpinnings also give it the widest body of these three cars. The first and second row seats meanwhile, are large and accommodating. Yes there is a third row as well, made up of two jump seats in the boot. They aren't very safe in case of a rear end collision, but are an advantage over the other two cars nevertheless. 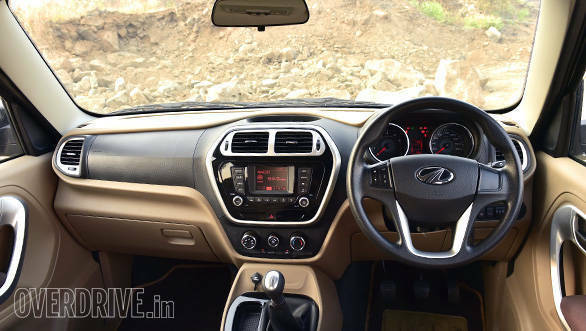 The Mahindra TUV300's dashboard looks smart and functional, however, the integration of the AUX and 12v ports look like an afterthought. I would have preferred a more conventional placement for the window switches as well, which are now placed on the tunnel console. That said, all controls fall easily at hand. The TUV300 also has plenty of cubby holes and spaces for knick knacks and most of them are easily accessible too, unlike the Ford. Given its price point, the Maruti Suzuki Vitara Brezza will also take on the likes of the Swift and the Baleno. It takes a similar all-black approach for its cabin too. But though it doesn't share showroom space with the Baleno, I would urge you to test drive both these cars. There is a stark difference in the quality levels of the materials used. The Brezza too gets scratchy plastics, but the fit and finish doesn't match up to its siblings. In this test, it was on par with the Mahindra, but never felt as sophisticated as the Ford. I had criticised the EcoSport's plastics when I had first reviewed it, but all the rivals that followed haven't fared any better. 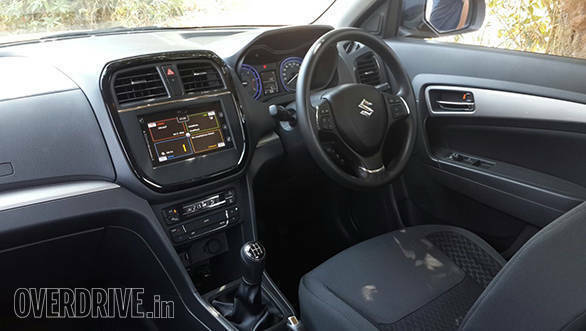 The Maruti Suzuki Vitara Brezza incorporates the SmartPlay touchscreen infotainment system that is now common with Maruti Suzuki's premium offerings. It easily pips the other two cars with its Apple CarPlay integration, a satellite navigation system and a cleaner and more ergonomic interface for its switchgear. Most switches and ports come from Maruti's common parts bin, which means you could either appreciate the familiarity or feel shortchanged as the Vitara Brezza's cabin makes it feel like just another Maruti. The latter is more likely as the Vitara Brezza's cabin, despite being smart, doesn't replicate the flamboyance of its exteriors. Its marketing hoopla which includes terms like 'sporty', 'fashionable' and 'youthful' start dwindling away in here. Most of the kit worth talking about is only restricted to the top-spec ZDi and ZDi+ trims and in that sense, the mid-spec variants of the Mahindra TUV300 and the Ford EcoSport offer a lot more value. The Maruti Suzuki Vitara Brezza scores big on space though. It isn't as large as the Mahindra TUV300, but is significantly more accommodating than the Ford EcoSport. The legroom and headroom even at the back are quite sorted. It gets smaller seats like the Swift though, so under-thigh squabs feel inadequate. One major design flaw that needs to be addressed is the placement of the seat rails which cut sharply into the rear foot-space. A driver airbag is standard on the base trim of the Maruti Suzuki Vitara Brezza. 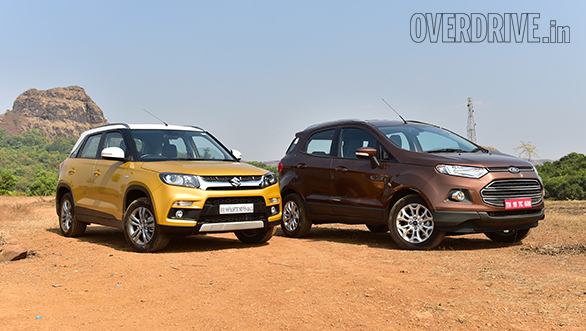 The Mahindra TUV300 and the Ford EcoSport only get them from the mid-spec trims. Anti-lock brakes are optional on the Vitara Brezza, which is very disappointing! They should have been standard across the range for all these cars, given their high price points. Maruti Suzuki is quick to point out though that theirs is the only vehicle tested in India for offset and side collision impact - a test that the ARAI will make mandatory from 2017. The Ford EcoSport is still the safest car of this lot and it drives pretty well too. It employs MacPherson struts upfront and a semi-independent twist beam setup at the back. Though it doesn't handle like a typical Ford, it is quite sorted for the kind of car it is. Body roll is comparable to other hatchbacks, while shock absorption is quite good. 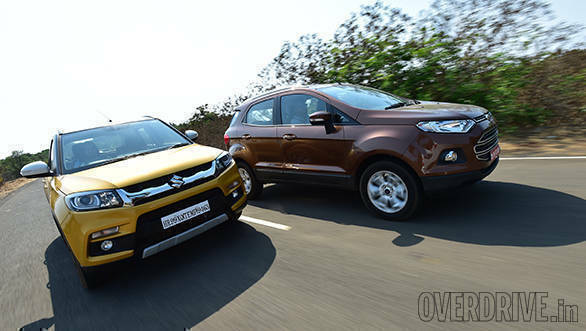 It is still a tad stiffer when compared to the Maruti Suzuki Vitara Brezza, but that rewards the Ford EcoSport with better handling characteristics. However, the Ford could have done with better tyres. The Mahindra TUV300, like most other Mahindra SUVs, has excellent ride. The soft suspension absorbs almost everything that the Indian roads have to throw at it, without any of it reaching your backside. But on a series of undulations, the vehicle does tend to bounce around a bit. It's the same around twisties too. The Ceat Czars offer decent grip on tarmac and that imparts a bit of confidence, but the Mahindra TUV300 clearly isn't a 'sporty' utility vehicle. It will happily glide over broken roads and potholes instead and that's what it ideally set out to do. 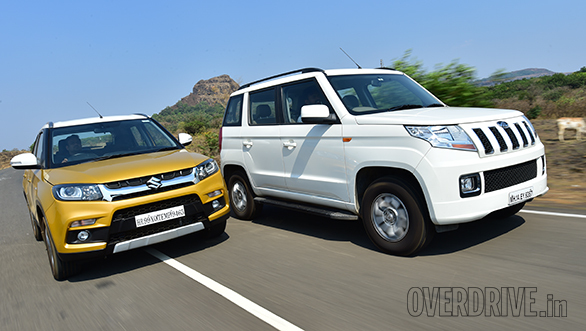 The Maruti Suzuki Vitara Brezza achieves a nice balance between the two. Being designed and made in India, Maruti Suzuki has poured in all their know-how to set this car up for Indian roads. You will instantly realise that it doesn't have the stiffness that its European siblings like the Swift or Baleno do. This one is much softer. It does tend to get noisy with all the thudding and crashing sounds over deep potholes or sharp bumps, but it absorbs most of them pretty well. But at the same time, it doesn't roll around too much either. It has a bit of initial dive at turn in, after which the car maintains its composure. The Apollo Alnac 4G tyres on our test car had admirable grip through the winding roads of Amby Valley and easily outclass the tyres on the other vehicles. These of course, were shod on the 16-inch wheels and it will be interesting to see how the higher profile 15-inchers fare on the mid-specs trims of the Maruti Suzuki Vitara Brezza. But in a nutshell, the Maruti Suzuki Vitara Brezza's balance of ride and handling left me impressed. The Ford EcoSport, like the Brezza, is constructed with a monocoque chassis. Its recent update gave its diesel engine a new state of tune. The 1.5-litre TDCi mill now puts 100PS of power which is 10PS more than its previous model. If you recall theses figures, this is the same output as the Figo Aspire's oil burner. However, in the Ford EcoSport, it doesn't feel as cracking to drive. It certainly is the quickest in this test with 100kmph coming up in 13.2s from a standstill, but remember that 'second' power band in the Aspire which kicks in at 120kmph? Well, that's not there in the EcoSport. The engine is more refined than its other two rivals and has a more linear power and torque delivery. Be it city or highway, it doesn't feel out of breath and pulling overtakes don't call for frequent gearshifts. The Ford EcoSport is also the most car-like to drive amongst these three and therefore, the easiest to drive. 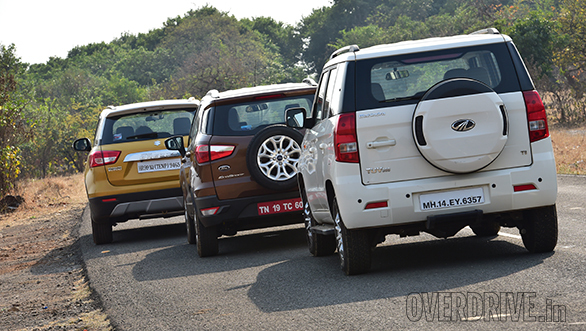 The TUV300 on the other hand will entice those looking for an SUV-like driving position. 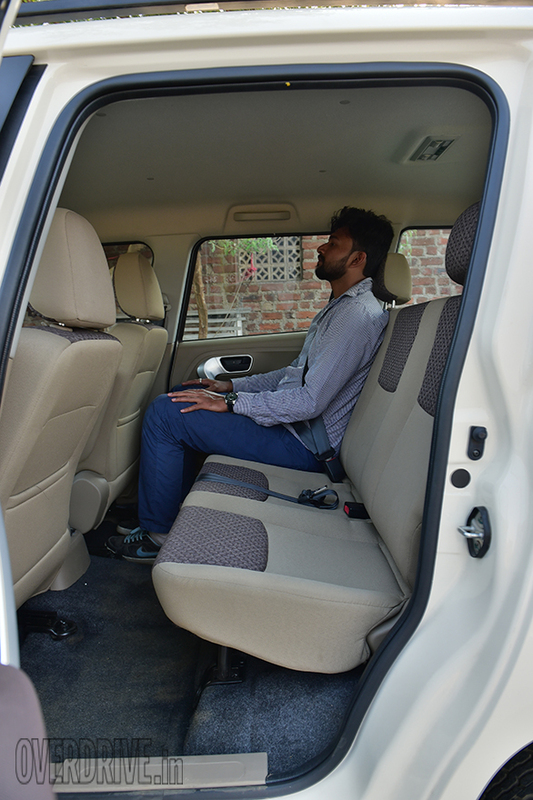 You sit as high as in the Scorpio and that gives you a more commanding view of the road. The engine is quite nice too for what it does. It is relatively rougher than its rivals, but also the torquiest of the lot. It offers most of that torque from as low as 1,100rpm which means that there is plenty of pulling power in almost every gear. That also means that even with a full house, the Mahindra TUV300 pulls cleanly and carries out most of its chores without breaking a sweat. It is the slowest to 100kmph though, thanks to its undisclosed yet evidently heavy weight. Speaking of weight, the Maruti Suzuki Vitara Brezza is the lightest car of the trio and that helps. Despite having the smallest engine in this test, it was only about half a second slower to 100kmph than the EcoSport at 13.8s. But it can achieve a top-speed of over 180kmph without feeling unnerving. The engine does feel stressed past the 170kmph mark, but with a full house you won't be reaching those speeds easily and it would be illegal and unsafe on our roads anyway. The Brezza uses the trusty 1.3-litre Multijet engine, but unlike its hatchback siblings it uses the more powerful version from the S-Cross that gives it an output of 90PS and 200Nm. It also brings with it a variable geometry turbocharger which aims at eliminating turbo lag. But in the real world, the car suffers from a weak low-end. The gearing ensures that it has enough juice to putter around town at low engine speeds, but pulling overtakes often requires a downshift. The clutch and the steering are quite light for city use and though the latter feels quite direct, I would have liked it to be a tad heavier at higher speeds like in the TUV300. All three cars come with five-speed manual gearboxes for their diesel engines, however, the TUV300 does have the edge here with its AMT option. The throws of the gear shifter are longest in the Mahindra TUV300, while the Maruti Suzuki Vitara Brezza has the shortest throws and the slickest feel for its shifter. Braking is another important area of distinction among the three cars. 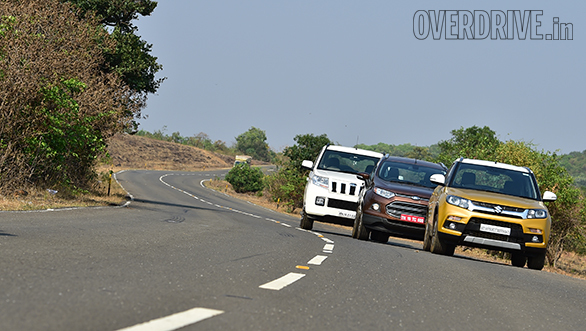 The Mahindra TUV300's brakes feel a tad grabby and sudden and need getting used to. 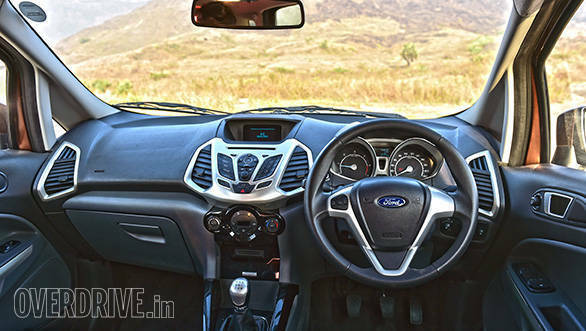 The Ford EcoSport's disc and drum setup feels spongy and in our previous tests, it was provided inconsistent feedback. The Maruti Suzuki Vitara Brezza brakes are excellent, surpassing the other two with precise feedback and a progressive feel. However, these brakes are known to eat up their brake pads in less than 15,000kms  a bargain you will make for their superior feel. In a nutshell, all the three cars are quite different in the way they drive and target their audience. 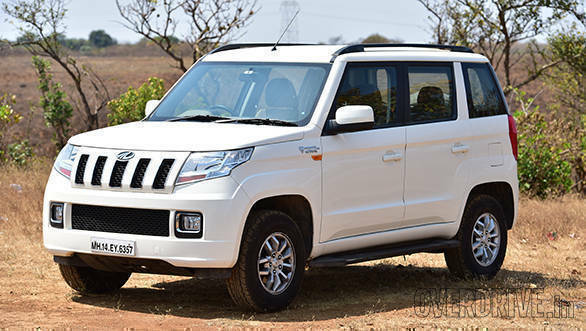 The Mahindra TUV300, though relatively utilitarian in feel, presents itself as a more stylish option to workhorses like the Bolero and Quanto. It is surprisingly well-put together for its price, and is the only crossover in this space to offer a seven-seat configuration and an AMT. In that sense, it offers tremendous value. 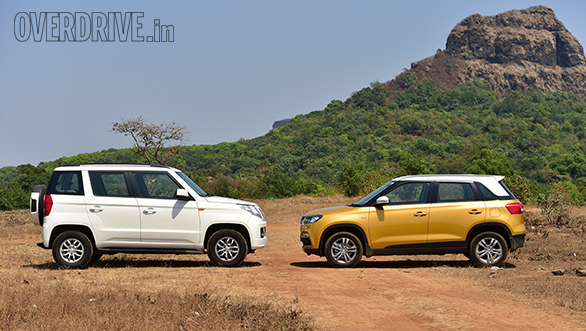 In the various stints that we had with it, the TUV300 has always proved to be tough and surprisingly reliable, which is what its target audience is looking for. The Ford EcoSport is stylish and sophisticated. And though it has had small niggles every time we tested it, we have rated it high for the level of safety it offers. It also has the most diverse drivetrain options in this lot. Maruti Suzuki however, has narrowed down the options because it knows exactly what the market wants  a reliable, good looking compact SUV that comes with the promise of a robust service network. The Maruti Suzuki Vitara Brezza is not the best car in this price bracket, but it certainly is a package that offers the most peace of mind. I won't be surprised then if it manages to sell in more numbers than the others combined.